But there was an awesome surprise in store for us - look at who's sponsoring his team!!! Yep, the mighty Cork Tavern of Glenside (last year the team was sponsored by an attorney's office). Though I drive by it every day on the way to dropping Gus off at school, it's one of the few local pubs I haven't patronized. Here's a review I found on Yahoo. Local: "While it can be intimidating sometimes for non-locals, The Cork is my alltime favorite bar. It's not the nicest or the cleanest or the best smelling, the menu's limited and the guy sitting next to you may be missing teeth/fingers/normal brain function but it still beats any place else to tie on a cheap load." BWA HA HA HA HA!!! Okay, so I can't see taking the team there for a post-game celebration, but I think the parents definitely need to make a field trip. 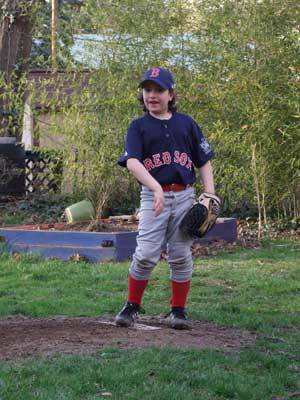 Go Cork Tavern Red Sox!!! I see a Cork Tavern pilgrammage in our future!! What can I say about the boy? Handsome! Adorable! Is the Cork Tavern the one next to the old Glenside movie theatre, on Mt. Carmel Avenue? Gus certainly looks fine in his uni. 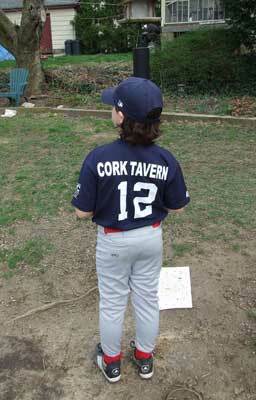 A little like Jonathan Papelbon, eh (if Jonathan had "Cork Tavern" on his back)?